Thailand has marketed itself perfectly, as a budget destination that has all the right ingredients for a typical ‘paisa vasool’ holiday. Although this destination is normally one of the first stamps on a number of Indian passports, I am sure that there are a number of people that aren’t even aware of the other side of Thailand and how great a NO ‘exotic beach holiday’ to Thailand can be. Thailand's northern capital Chiang Mai is a more relaxed escape from the whirlwind pace of life of its southern popular rival. I think this was one of the wisest destination choices and it was a perfect getaway and a fun family holiday. 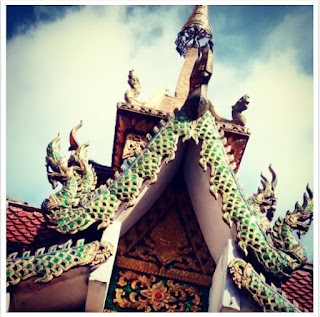 Chiang Mai is a city in mountainous northern region of Thailand and it dates back to the 1200s .Popularly known as the trekking base of Thailand this quaint city is located at a 300 m elevation in a vast mountainous area. It's province is known for its access to adventure sports , white water rafting , walks into the relatively high mountain ranges , abundant flora- fauna, and cooler weather. Chiang Mai is popularly known for the mountaintop temple of the Wat Doi Suthep, the central shrine that houses the seated Buddha. You can reach the temple by hiking up the Monks trails across the mountain road ,by renting the easily available bikes or hopping into a songthaew , the local red truck – communal cab (basically a modified pick-up truck with a roof and 2 benches). Overlooking the city from its majestic seat , the Wat Phra That Doi Suthep is one of northern Thailand's most sacred temples. As you arrive at the temple you are reminded that one needs to earn their blessings and are guided up a 400 step climb. This walk is pretty interesting, lined by giant snake idol railings and numerous local vendors along the way you get a great flavour of the local buzz. The first view of the temple is truly therapeutic and one can definitely spend some time here. There is a dress code so do remember to carry a sarong to cover your legs before you enter the temple. Chiang Mai is a city in mountainous northern Thailand that dates back to the 1200s and is known as the trekking base of Thailand. The number trails that take you through hidden waterfalls and dense paths, will also lead you towards the riverside where you can choose to spend the afternoon at a local shack taking a Thai cooking class , relax and watch the elephants being cleaned or even maybe fly through the jungle. We chose the locally popular company called Flight of the Gibbon to plan our day. It is a known fact that one shouldn’t encourage the elephant rides or the tiger petting zoos in the country and having said that we were glad to note that Chiang Mai houses the Elephant Nature Park, an elephant rescue and rehabilitation center in Northern Thailand where you can volunteer and visit to help and get to see the animals. Chiang Mai — “New City” in Thai — is actually more than 700 years old but was new when the capital was moved down to the banks of the Ping River from Chiang Rai. Its Old City area still retains parts of the wall and moats along with the original city gates. The main gate, Tha Phae, is on the eastern side and facing the river Ping. The other gates are Chiang Mai Gate to the south, Suan Dok to the west and Chiang Puerk to the north. The Old City comes alive every weekend and turns into a walking street complete with a craft market, local bands and musicians. If The night markets of Chiang Mai are a must visit to get a feel of the local delicacies, local art and get a buzz of the town. By northern Thai standards, Chiang Mai old city centre has a pretty active night-life scene, with everything from trendy riverside bars to student hangouts and karaoke pubs. If the neon graffiti lining and lights leading to creepy and rickety staircases don’t confirm what kind of places are around the corner , then the throbbing drum and bass certainly will. Rooftop bars in Chiang Mai are rather down to earth and have a perfect laid back backpacker vibe. We ended out exploring the popular THC Rooftop Bar as we following the music. You have not explored Chiang Mai until you have visited at least two or three markets and the city is full of them .You do not need to follow a recommended list but in fact ask the locals , there are markets cropping up and buzzing each season you will definitely find your way to a few. In all I think this is a great getaway destination with bustling street markets and coffee shops on every corner, cozy quaint guest houses and an option to escape into the mountains and into the NORTH.